Lobos UAD to a victory of the Championship! With an aggressive on the offensive during the 40 minutes of action, Lobos UAD Mazatlan won 106-86 to Frayles de Guasave, to devote themselves as champions of the circuit for the first time in history. The great figures of the meeting, which was the seventh in the series, were on the offensive Mugabe Thomas and Larry Taylor, who scored 35 and 30 points respectively. Mazatlan was a great game along the four time periods, with the first three where Mazatlan underpinned the front that became the new sovereign. 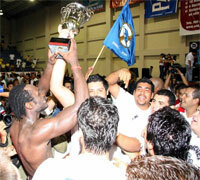 With this, the Lobos UAD Mazatlan rounded his season as the Title joins the first regular succeeded in the role. The last period was almost a mere formality for the home, even those who were given the luxury of drawing the three aliens with little more than a minute to play and more than 15 point lead. The La Salle coach Taylor was the victim of the traditional bath of champions when seconds remaining for completion. The festival, including live band, was unleashed when the horse mackerel sounded and the players, along with its large fans, celebrated in the middle of the stave in the middle of the 'Corrido of Mazatlan,' 'The Manicero', 'El Sinaloa' 'El Toro Mambo' and other songs typical of the tambora Sinaloan. The intensity that was lacking at the sixth meeting today if he was with the players Lobos UAD Mazatlan, who initiated the meeting with all in search of the ring rival and remained until the end. etc. At halftime the winner of the Three point contest was won by Mexican player Edgar Soto (192-F/G-77) the native from Navojoa won the 3 point contest against Ron Selleaze (197-F-76, college: CSU Bakersfield) by 19 baskets made by Soto , for only 7 for Selleaze who was force to made 19 baskets. In the dunk contest Larry Taylor (186-G-80, college: Missouri Western) took the honors with a amazing dunk, that put fans on there feet and all the players of the bench. At halftime the Acro Dunk put some jumps with their little trampolin, having high flying dunks, Acrobatics moves in the air, and the fans loved their show, the mascot ''Yeti'' had Kids cheer him with his jokes with players.The best player and the MVP of the game was the local player from Trigueros Cd. Obregon Dontae Truitt (198-G/F-81, college: Georgia SW) with 26 points.CIBACOPA has been involved in the comunnity, with the program Butaca Enlace, having kids with good grades in school, going free to watch the players and the action of the CIBACOPA for free. Congratulations to the CIBACOPA and all the players!!! Jose Manuel Gutierrez (182-G-84) (Cd Obregon). The first time the event was the semifinals of the competition of shooting, 3, which defined the two finalists, which were found to be Edgar Soto (Navojoa) and Ron Selleaze (Ipswich). 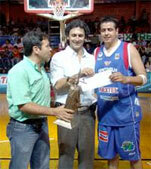 During the final of the 3-point, the player Paskolas of Navojoa Edgar Soto rose as the undisputed winner, adding 19 points from a maximum of 30 possible and that in a moment of his round, reached dunk shot and three-8 of consecutively supported by the applause of the crowd that did not stop chant his name. Immediately after we held a contest for nailed, with the participation of Larry Taylor, Mugabe Thomas, Henry Latravent and Leon Smith, who had three opportunities to shorty the ball and move to the final. This stage was a 3 jury members of the local press and in addition to Galen Robinson, nominated as the player most valuable star game held the previous season. The finalists were Larry Taylor and Henry Latravent; who delight audiences with two shorty worthy of being called the best in the history of competitive nailed. Henry Latravent made a leaping nailed above 3 persons and Larry Taylor made a spectacular leaping shorty on his partner Ron Selleaze in Lobos UAD, who was seated in a chair, gave the pass to Taylor that the key strength, making the the public was lifted from their seats vitorear this excellent demonstration of extreme skill. The latter nailed Taylor was the one that defined the balance in his favor to be nailed as the Champion of 2008 Cibacopa. After the awards in both competitions, the presentation of the group would Acro Dunk, who from the outset captivated the public's attention with their acrobatic nailed that seemed to defy gravity. For 10 minutes the audience was in a euphoric state, non-stop applauding each and every one of the shares in this group of acrobats, who 'stole the show', by the way they interact with people and what their spectacular moves. After nearly an hour's time, resumed the actions of the encounter, with a third quarter that saw the North Stars, led by Dontae Truitt of Cd Obregon, managed to break away on the scoreboard to finish with 11 points on South , That advantage is no longer lost in the last quarter, to be the final score of 116-105.